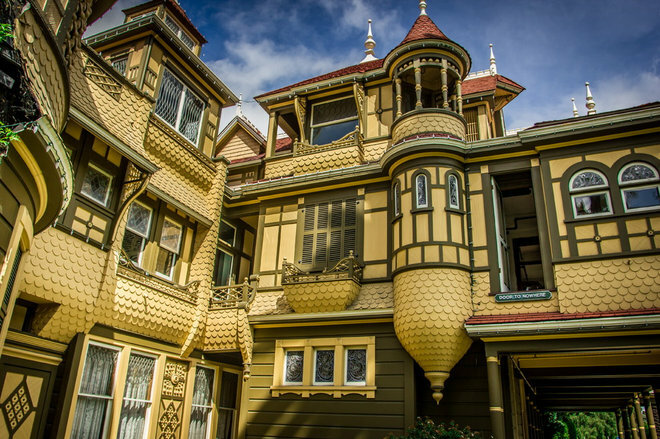 With its witch’s hat turrets, spiderweb windows and Gothic spires, Sarah Winchester’s 24,000-square-foot Victorian house in San Jose, California, draws tourists from around the world, especially at Halloween. They hear tales of its construction inspired by guilt and its haunting by ghosts. A movie starring Helen Mirren opening Feb. 2 is bound to reinforce the labyrinthine mansion’s spooky reputation. But to the rifle fortune heiress, it was simply her hobby house. 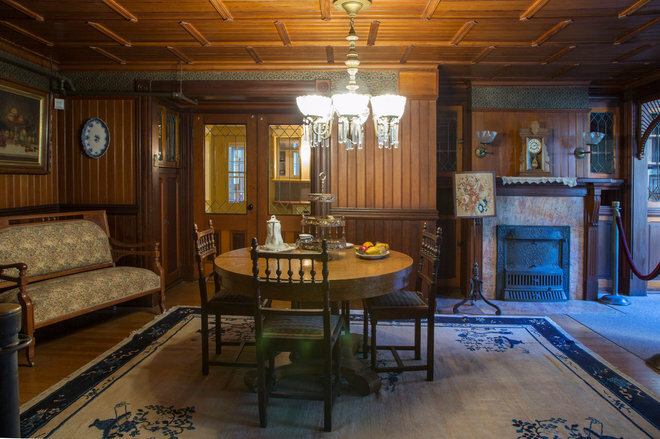 From 1886 to 1906, she lavished time, attention and considerable cash on the workshop where she unleashed her ambitious architectural fantasies using the most luxurious and innovative materials of her time. The jumble of rooftops provides a sharp contrast to the manicured 6-acre grounds, all that remains of Winchester’s onetime ranch of about 160 acres. 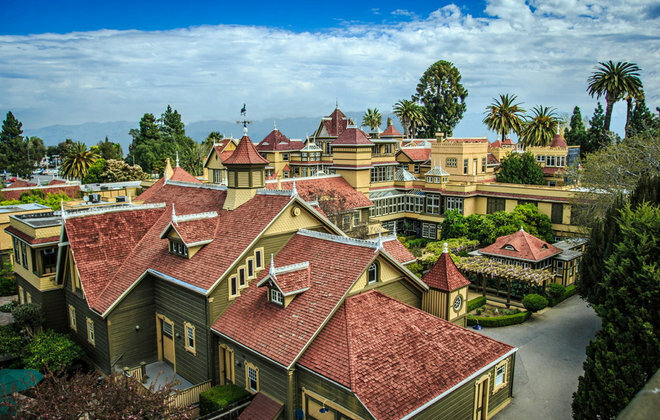 Now known as the Winchester Mystery House, the Queen Anne has 160 rooms by today’s count but contained many more at the turn of the 20th century. What possessed a lone widow to travel across the country, buy a small farmhouse and spend decades transforming it into such a colossal crazy quilt? Even in her lifetime, locals began to murmur that the reclusive heiress must be mad. 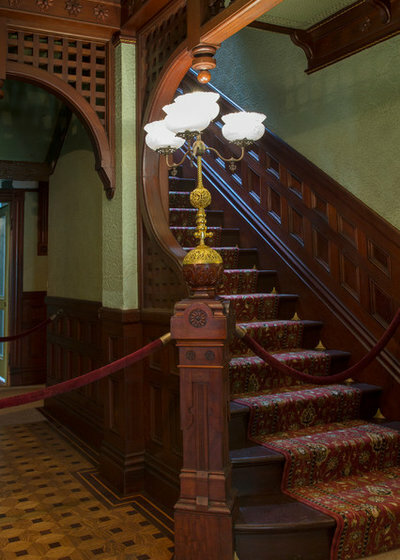 The eventual story that a spiritualist had advised her to keep building to appease the ghosts of those killed by Winchester rifles has attracted an estimated 12 million visitors since the home opened as a tourist attraction in 1923, Winchester Mystery House spokesman Tim O’Day says. Many of them come from Australia, Canada, China, Germany and Japan, in addition to the United States. Some have reported experiencing paranormal activity. The lore of the house provides fodder for filmmakers: Brothers Michael and Peter Spierig (Predestination, Daybreakers) in March will begin production on a movie starring Mirren as Winchester, according to Variety. It also overshadows the accomplishments of its forward-thinking owner. By the time Winchester at age 47 arrived in pastoral Santa Clara County, California, from her native New Haven, Connecticut, she had seen her share of tragedy. Her only child had died in infancy 20 years before. More recently, her mother, father-in-law, sister and, most crushingly, her husband, William, had passed away within a few years. She and three sisters, with families in tow, headed west to start life anew. 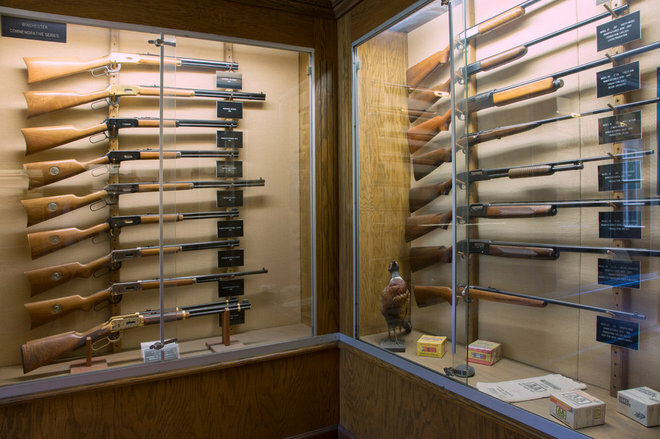 A firearms exhibit on the grounds traces the history of the Winchester Repeating Arms Co., celebrating its 150th anniversary this year. Winchester inherited a nearly 50 percent stake in the Winchester Repeating Arms Co., maker of the so-called Gun That Won the West. By the turn of the 20th century, her fortune was estimated to be $20 million. In 1886, according to county records, she bought a two-story farmhouse on 45 acres for $12,570 and embarked on an expansion so that she could better accommodate her relatives. 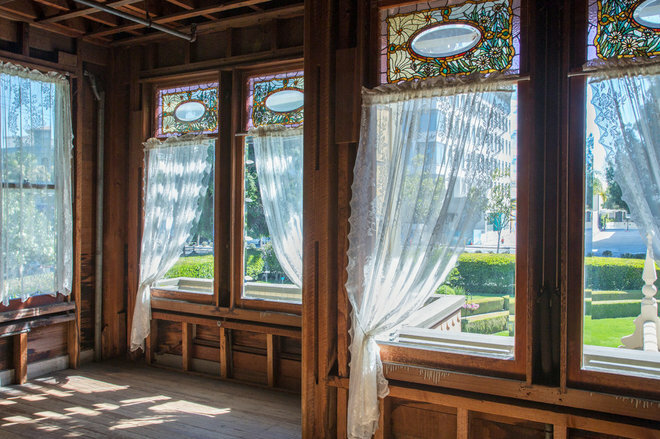 Before long, her sisters were settled elsewhere in the San Francisco Bay Area, but by then, Winchester was hooked on her house project. The Venetian dining room, named for the Italian marble fireplace surround, is being restored to how it may have looked in Winchester’s day. For the next two decades, Winchester subscribed to Architectural Record and other building journals in English and French, and personally oversaw the massive construction project. 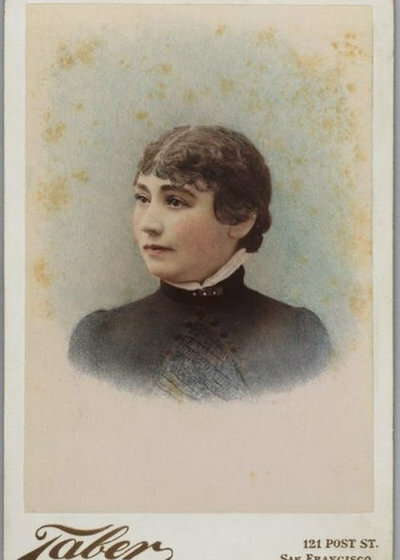 She directed woodworkers, plasterers, tile setters and plumbers. If the result didn’t satisfy her, she had it torn apart and reworked. She spared no expense. 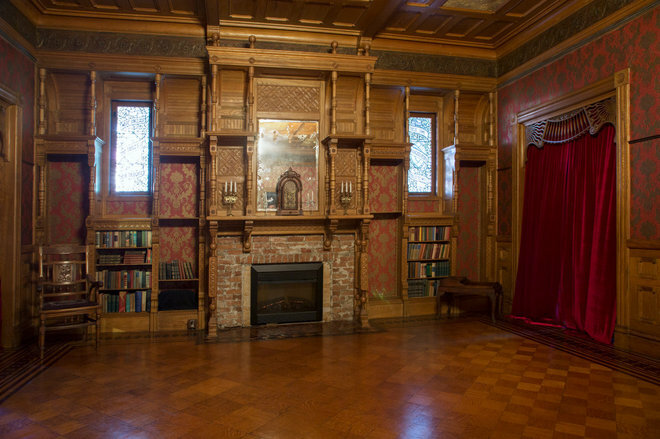 Winchester bought adjoining properties and began experimenting with higher structures, directing the addition of stories with completely different ornamentation inside and out. Extensions to the house regenerated at spots where a previous one had been severed. She didn’t work with a full set of architectural drawings, but rather sketched plans space by space, whim by whim. The crowning glory was a seven-story tower that soared over everything for miles around. Certainly, the house has peculiarities. 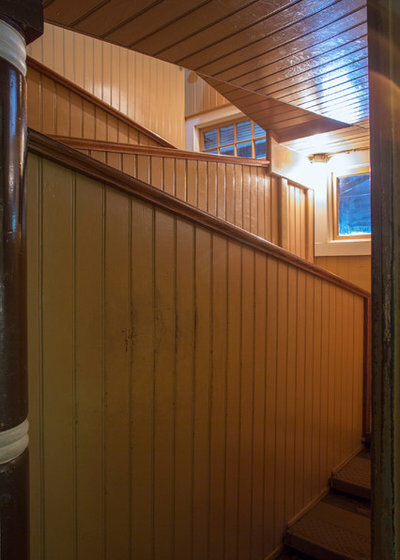 Why does this staircase lead to the ceiling? Some say that Winchester was trying to thwart evil spirits. But there are more down-to-earth reasons. 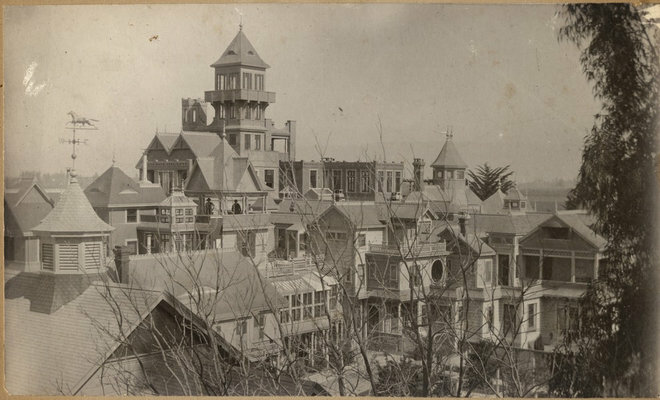 The San Francisco earthquake inflicted massive damage to Winchester’s home. The tower collapsed, taking with it the top three floors. Rather than rebuild, she ordered the debris removed, and sealed off open chimneys, staircases and porches. According to Fred Marriott, her niece’s husband, she was embarrassed that her building directives didn’t stand up to the quake. 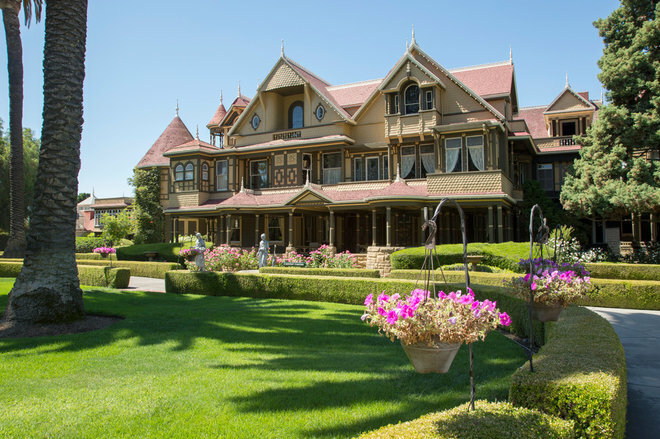 Although legend has it that building on the house continued nonstop for 38 years, Winchester moved to a new home in Atherton, about 20 miles northwest, after the earthquake. By this time she was approaching 70, in an era when an American woman’s life expectancy was about 49. She took up projects at her other properties on the San Francisco Peninsula and carried out only maintenance work in San Jose. On the public tours, much is made of the spiderweb tracery decorating some of the windows. 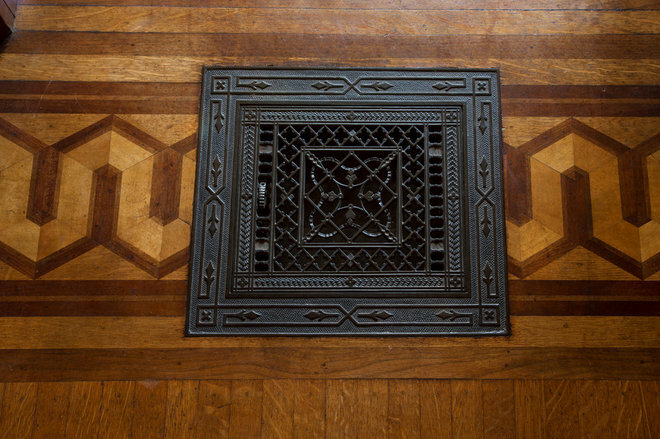 But this motif, a nod to Gothic, was popular in the Victorian period. 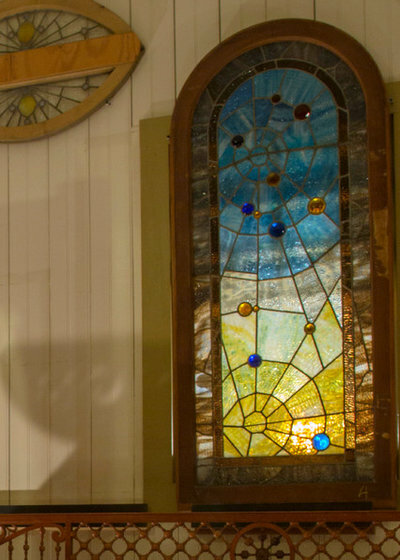 There are 13 round glass jewels in this spider-themed window. Intentional or coincidental? There’s no doubt about the exquisiteness of Winchester’s large collection of art glass windows and doors, some of which were never installed. Visitors can view the ones in storage from behind glass. Details about their provenance are sketchy. 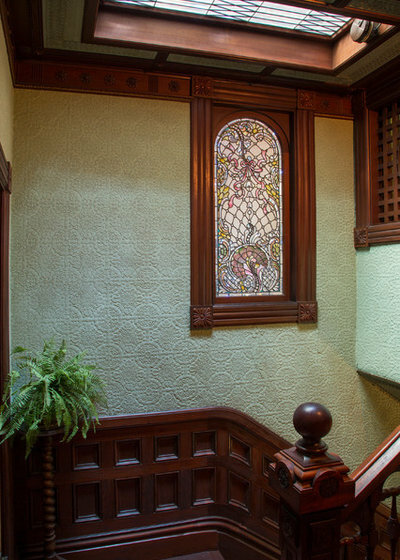 The art glass window at the top of the main staircase is among the collection’s most elaborate. The skylight is one of 52 in the house, says tour manager Janan Boehme, who has worked here on and off for 30 years and is spearheading some of the restoration projects. 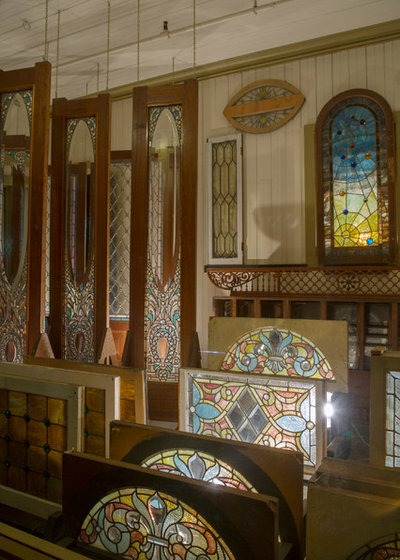 In recent decades, the skylight had been filled with plain glass until Boehme found the leaded original while combing through storage rooms cluttered with hundreds of items. “This house is like a giant jigsaw puzzle!” she says. Likewise, the art glass windows above the fireplace in this formal dining room had been missing for years. Boehme rescued them from storage after determining their dimensions to be an exact fit for the openings. 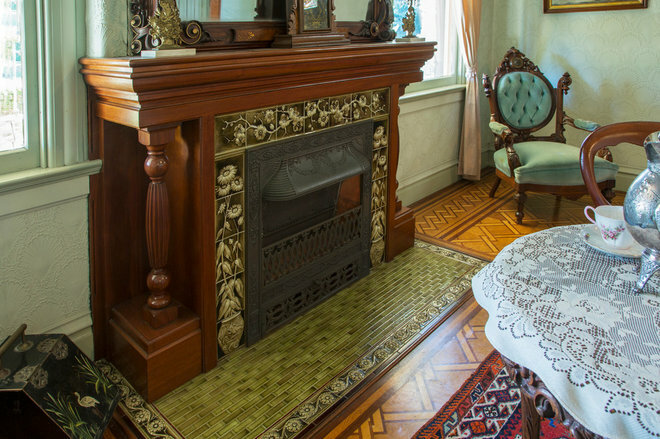 The fireplace surround is an elaborate combination of carved woods, Lincrusta wall covering, and iron and brass fittings. The tilework is original and in good condition. 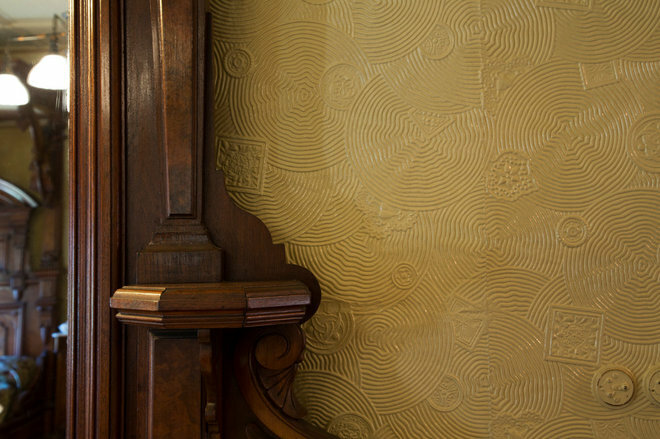 Lincrusta was a popular design element in Victorian homes because it was washable, durable and lent itself to decorative effects. The wall covering is made from linseed oil and wood flour, embossed in designs that stand out in relief, then painted after installation. Lincrusta was invented in 1877 in England, where it’s still made, but Winchester ordered hers from Fr. Beck & Co. in her home state of Connecticut. 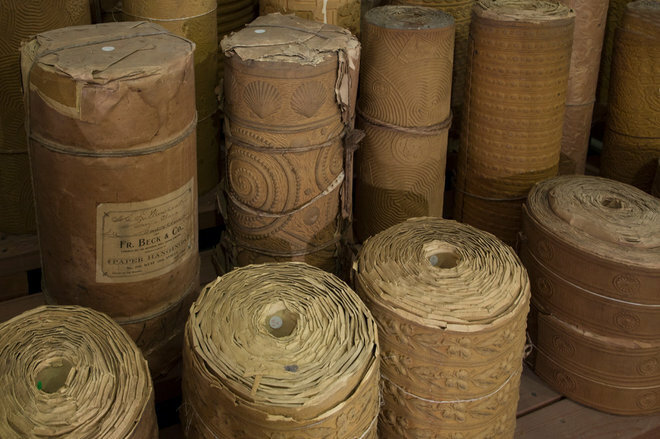 Rolls of Lincrusta shipped to Winchester more than a century ago still sit in storage. The hundreds of linear feet represent more than 20 patterns, Boehme says. Paperhanger Heidi Wright Mead recently installed some of it during a hallway restoration at the mansion. The fine materials and craftsmanship Winchester demanded are in abundant display in the ballroom, her pièce de résistance. It isn’t particularly large, but it is a compendium of hardwoods, including inlays of teak, maple, ash, mahogany and rosewood. 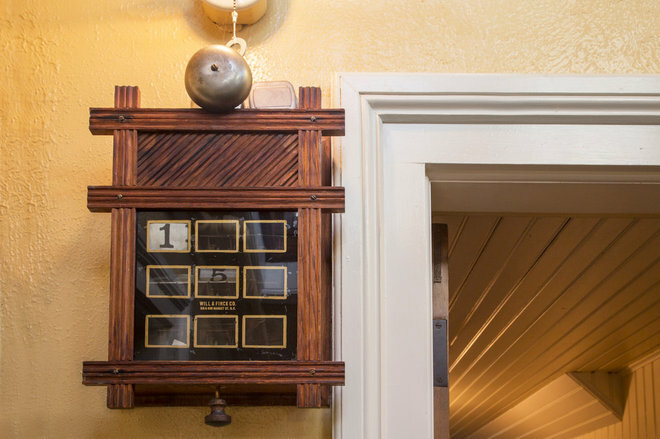 Expertly crafted moldings decorate at multiple levels, and secret drawers hide in panels in the walls. Restoration work revealed that hardly any nails were used in the room’s construction. Winchester’s fascination with the building arts probably began in childhood. Her father, a woodworker, operated a specialty mill that fashioned the architectural details popular during the Victorian era. Many years later, an employee remarked that she purposely dreamed up new projects at her house to give the carpenters some job security. Flanking the fireplace are the only two art glass windows designed with words. The significance to Winchester of the quotations from Shakespeare’s Richard II and Troilus and Cressida has proved elusive, however. Such a large residence presented challenges, among them communication. A precursor to modern intercom systems, this 19th-century annunciator allowed Winchester to let her servants know which room she was in when she needed assistance. When she pushed one of the call buttons located throughout the house, a card dropped into a slot indicating her whereabouts. During this era, many wealthy people had such a system. Heating and lighting the enormous house also posed difficulties. 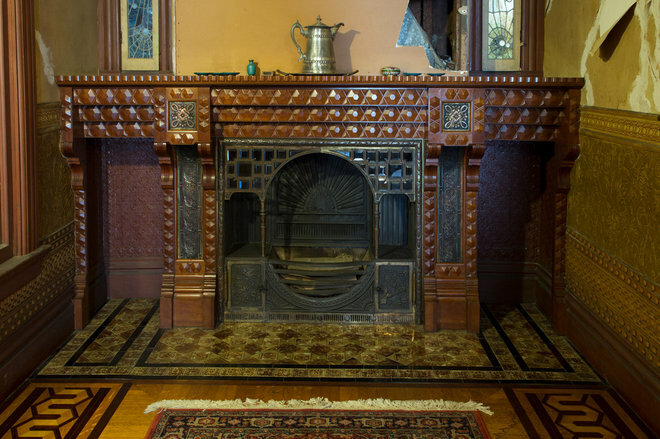 This beautiful fireplace, in a parlor not normally open to the public, is one of 47. A dozen burned wood; the others, coal or gas. Winchester wrote about hiring a furnace expert from San Francisco to help her “in getting the house comfortably heated for next winter.” Both steam and forced air were used, but the results were not completely satisfactory. 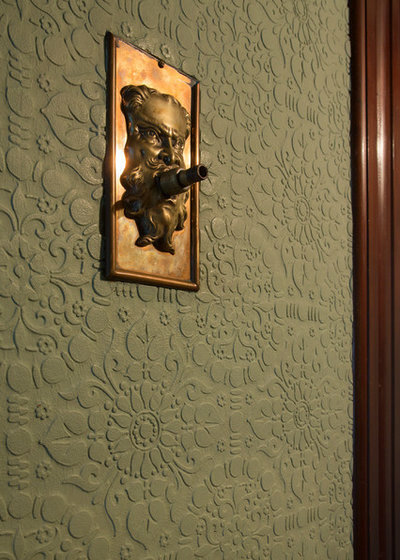 This fanciful gas jet stands out on a background of Lincrusta. Winchester had a carbide gas production plant installed on the property, and it piped gas throughout the house. The gas light fixtures and lamps had electrical starters. Eventually, a generator powered water pumps to electrify Winchester’s home. Originally equipped for simple candlelight, this newel post was changed to gas and finally to electricity. Winchester sent letters to relatives in the East indicating that her concern for safety on this staircase had prompted experiments with lighting. Metal fittings in the corners of each stair kept dust from accumulating in those crannies. Winchester paid particular attention to plumbing. 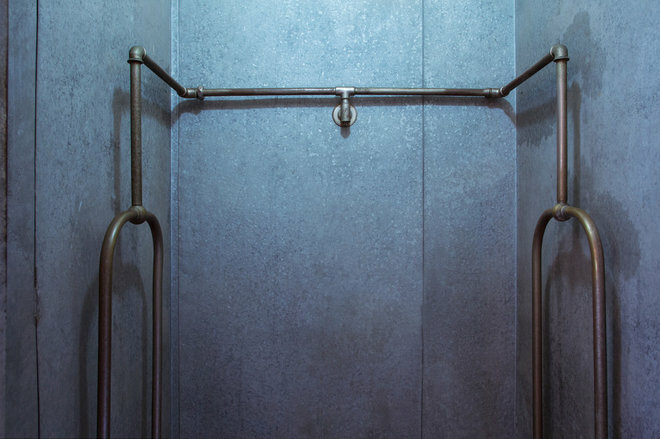 This is an example of a “needle shower,” an early version of a residential shower. Tiny holes in the pipes direct dozens of jets of water toward the body. When needle showers were new, they were recommended by doctors as stimulating to the internal organs, and the health-conscious Winchester placed an order. One of the earliest producers was The Peck Bros. & Co. in New Haven, the widow’s hometown. 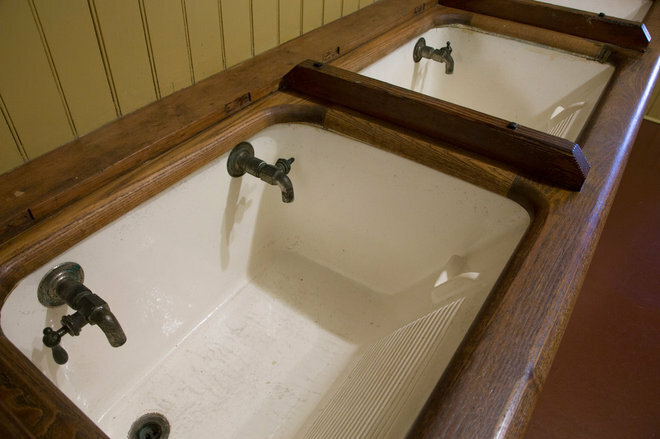 Winchester’s staff enjoyed fine bathing facilities as well. 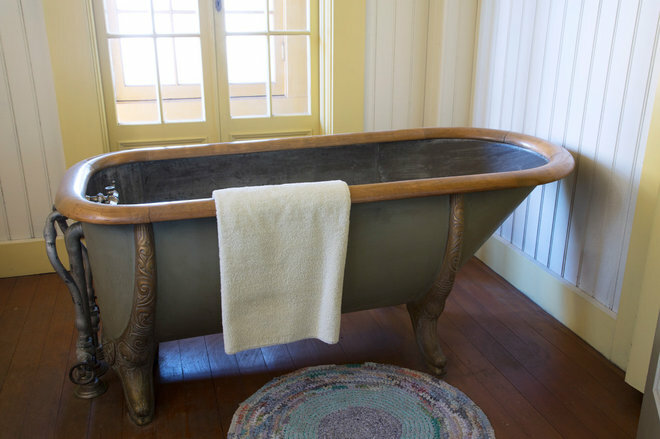 This cast-iron tub is in a servants’ bathroom on the third floor. 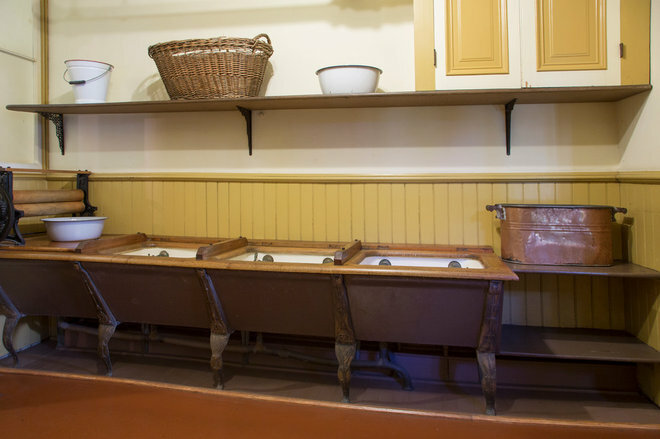 The large and airy laundry room, with a three-sink table and mounted wringer, was state-of-the-art. The laundress could begin at the right to wash, then rinse, then wring the clothing or linens. Each of the sinks has a built-in scrub board and soap holder. 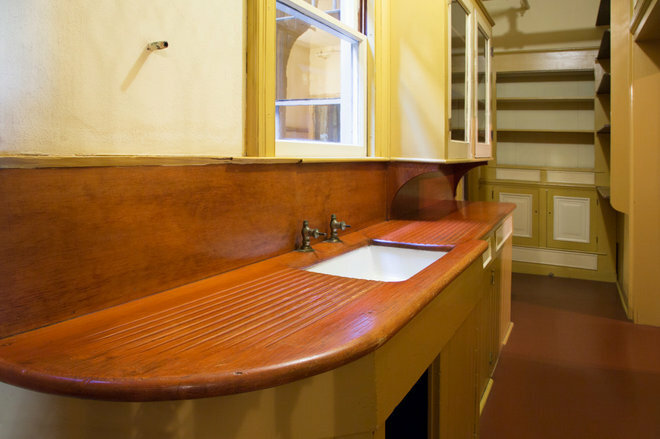 In the butler’s pantry, the grooved wooden counter slopes to send excess water back to the sink. 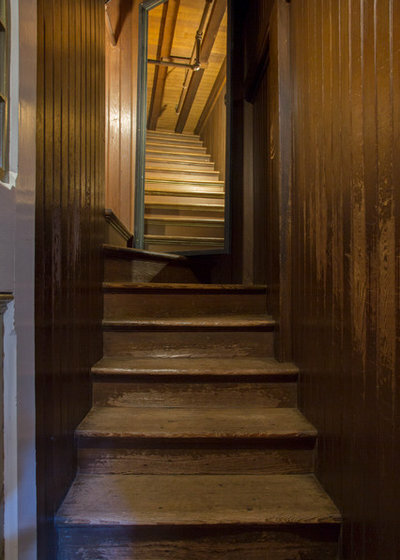 A century before the Americans With Disabilities Act, the 4-foot-10-inch Winchester installed this switchback staircase with 2-inch-high risers to accommodate her debilitating arthritis. It’s narrow enough so she could grasp the railings on both sides to hoist herself up. Later, Winchester had two hydraulic elevators and an Otis electric elevator installed. This conservatory still seems modern by today’s standards. 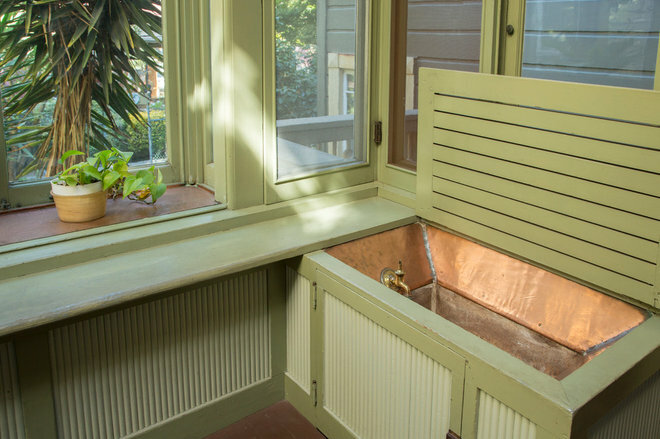 Copper clads the sink and window sill, which slants slightly toward a small drain. When plants on the sill are watered, the excess drains through a pipe leading to outdoor landscaping. Loose wooden floorboards lie like trap doors over a zinc subfloor. They could be lifted wherever Winchester wanted to set her exotic indoor trees and other plants to ease watering and prevent damage to the wood. Runoff flowed to a drain in the zinc and then to the outdoors. Winchester was apparently ahead of her time in conserving water in drought-stricken California. Although Winchester had a pragmatic side, she also cultivated beauty for beauty’s sake in her daily surroundings. 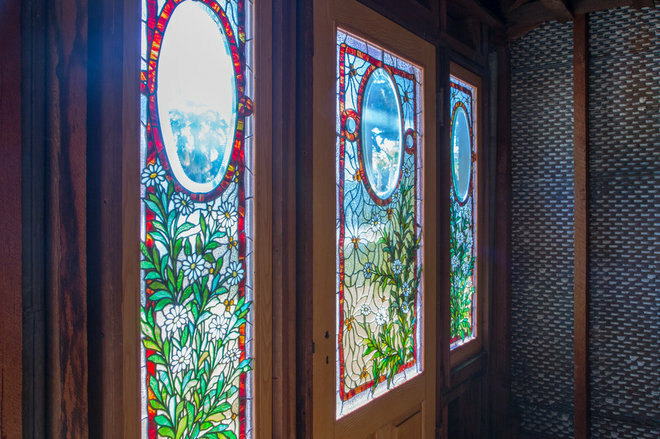 For the interior and exterior ornamentation of her house, she drew on her travels as a young bride; international world’s fairs like the 1893 World’s Columbian Exposition in Chicago; and Aestheticism, a late-19th-century movement that gave rise to the modern interior design industry. 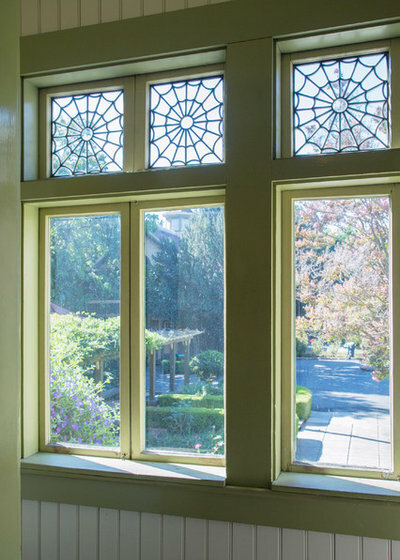 This suite of second-story rooms shows Aesthetic hallmarks in its stunning daisy windows: stained glass, nature, simple colors. Winchester’s niece Daisy Merriman lived with her for a dozen years and probably stayed in this suite. From these rooms, Merriman would have looked out on her aunt’s vast orchard. Winchester was among the first female orchardists in what became known as the Valley of Heart’s Delight. Today, the view is of Santana Row. This shopping district, the most exclusive in San Jose, had been part of Winchester’s ranch.